Dual Racor fuel filters for engine. Pre-wired and plumbed for future generator installation if desired. Heavy hand-laid fiberglass solid hull construction. Vinylester resins used in the outer layers to help prevent blistering. Epoxy barrier coating and hull paint below waterline. Integral grid structure is designed to provide a very sturdy, stiff hull. All handrails are of double-rung design for safety, and are welded and beautifully polished. Deck hardware is sturdy and high-quality stainless steel. FRP fuel and holding tanks. Stainless steel water tanks. Board from astern via a large swim platform though the transom door, or through side entry doors located in the port and starboard bulwarks. The cockpit is large enough for several deck chairs, and the cockpit cover extends the full length of the cockpit. Thoughtful design includes anti-drip edges and stainless steel drain spouts on the upper deck to reduce rainwater draining into the cockpit. The swim platform has removable safety handrails (staples). The lazarette below the cockpit provides a large storage volume. Hawsecleats make for convenient attachment of mooring lines. The sturdily-built wide sliding aft cabin door provides entry to the full-beam saloon, which is much larger than would be expected in a boat this size. The salon layout was custom-ordered by the seller and is designed to provide an especially large and comfortable "living room" function . A long L-shaped settee to starboard is for lounging, and includes two custom ottomans. A cabinet forward serves as a bookcase and conceals a Splendide washer/dryer behind louvered doors. The galley is aft port and features granite countertops, a 7 cu ft Novakool under-counter refrigerator/freezer, and a Force 10 propane range. Above the galley (and opposite the settee) is a drop-down cabinet for the TV (with Intellian satellite antenna). Forward of the galley and down is the day head -- complete with shower capability -- and an entry door into the engineroom. The pilothouse is just two steps up from the salon and integrated into the living spaces. The L-shaped dinette allows three or four guests to enjoy the pilothouse while underway. The helm station is to starboard, and features custom bench seat with drop-down bolster for leaning if desired. Forward visibility from the helm station is excellent, and because of the low pilothouse design it's possible to view the aft quarters directly from the helm seat also (unusual in a pilothouse model). Sliding pilothouse doors port and starboard allow easy access to the dock, the foredeck or to the flybridge. Footwells with high bulwarks provide security when exiting the pilothouse, and the wide, full-size steps to the flybridge make access safe and easy. There are no vertical ladders! The master cabin has a queen bed with custom memory foam mattress, hanging lockers port and starboard, storage drawers, two storage cabinets, bookshelves, and separate head and shower compartments. The flybridge has two pedestal seats and an L-shaped settee. As with the entire exterior of the boat, the design of the flybridge is uncluttered and intended to be simple to maintain and easy to clean. There is a canvas cover for the flybridge helm and seating. Two Dometic Cruisair reverse-cycle systems provide heat and air conditioning. And for fresh air this boat has nine opening windows (including an opening windshield window), five opening stainless steel portlights, and two overhead hatches. The interior is appointed with custom carpeting (with a reveal all around that shows the teak and holly floors beneath) and custom roman blind-type draperies. Nick Jackson Co. standpipe crane-type davit for dinghy. Furuno NavNet TZtouch2 multi-function 12.1" display (with built-in fishfinder) at lower helm; Furuno kw UHD radar; Furuno NavPilot 711C autopilot controller with color display (upper and lower helm); Standard GX2200 VHF/AIS. Intellian i3 satellite antenna with DirecTV receiver; Samsung Blueray player. This Helmsman Trawlers 38E Pilothouse is in extraordinary condition and has only 150 engine hours. This is one of the second-generation "E" models, which adds greater interior sound attenuation features, improved exterior water drainage, and many other aesthetic and functional enhancements to the earlier model. This model ships relatively easily overland, thanks to a removable flybridge cowling. The seller is willing to participate in the cost of overland shipment to the east coast, or in captained delivery to the Pacific Northwest. Currently owned as the sole asset of an LLC, which may offer tax advantages for a buyer. Special features include -- beautiful custom interior appointments and custom salon layout, Furuno navigational electronics, Intellian satellite TV, washer/dryer, cockpit side entry doors, Gig Harbor rowing dinghy (with Torqueedo outboard), bimini top and flybridge canvas cover, and more. The custom salon layout creates a roomy and comfortable living room afloat. Standard design features include a day head immediately off the salon, separate master head and shower compartments, and an extended pilothouse that serves as a comfortable living and dining area in addition to its piloting function. This is a very roomy and comfortable boat, yet fits in a 40 foot slip. Its 380 hp electronically-controlled Cummins QSB6.7 common-rail engine turns down nicely, and operates smoothly and quietly. She performs frugally at 7 or 8 knots, and has additional power when needed. 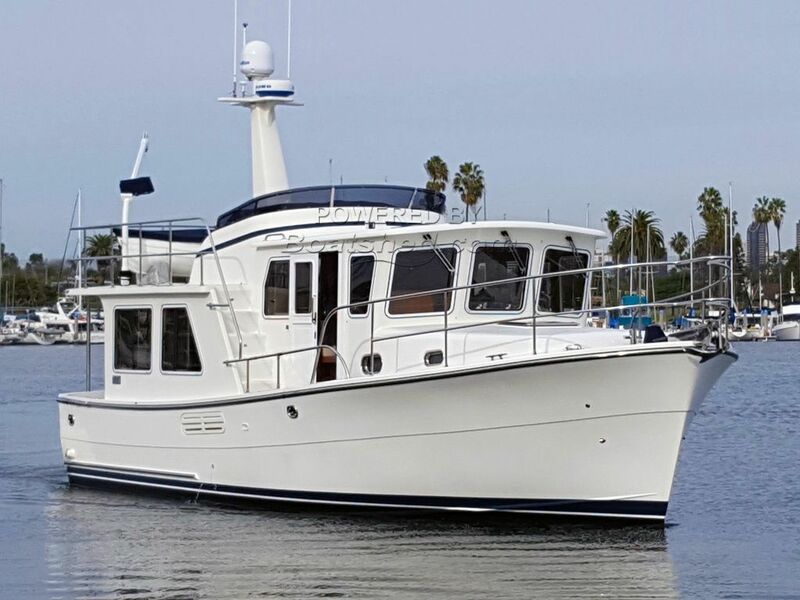 This Helmsman Trawlers 38E Pilothouse has been personally photographed and viewed by Scott Helker of Boatshed Seattle. Click here for contact details. Please note this comments section is public. Please do not post your personal details here. To enquire about purchasing this boat, please contact the broker directly at scott@boatshedseattle.com. Please read our commenting guidelines before posting.